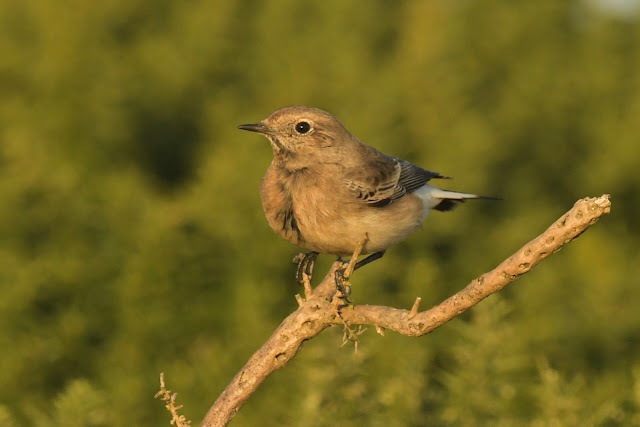 I've been waiting an awful long time to see Pied Wheatear in the UK, let alone Cornwall. I narrowly missed one in Shetland back in 1995 and I couldn't get to the male at the Dodman because I was working away. So its taken 34 years from seeing my first rare wheatear at Portgwarra to the recent Pied Wheatear at Trevose. 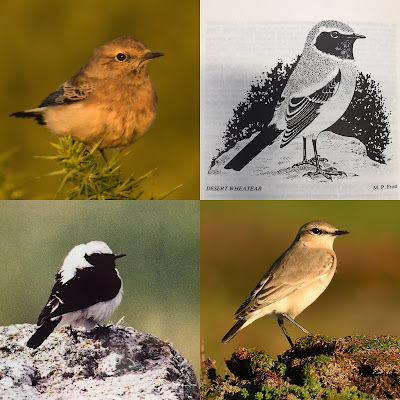 The male Desert Wheatear in November 1984 sticks in my mind most. I think it was just the seventh UK record at the time and many top name listers made the overnight journey to Porthgwarra to tick it. It was found by Laurie Williams and Rod Hirst on the moor just past the stone wall. I can remember now as it stood out like a beacon in the heather. What a find. 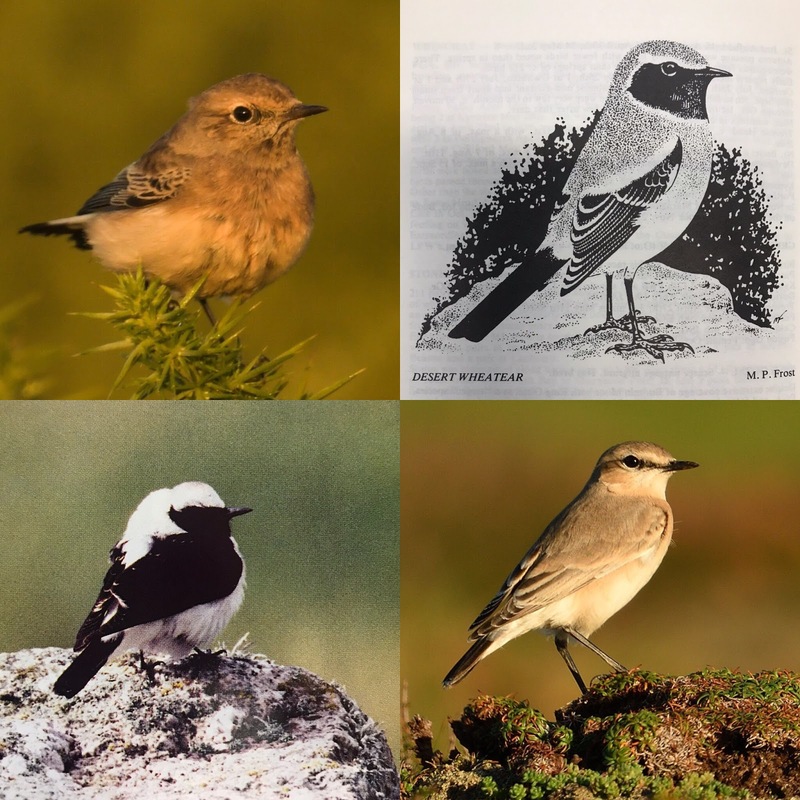 The adult male Black-eared Wheatear was found by Martin Elliott in the fields at the top end of Nanquidno valley in March 2002. 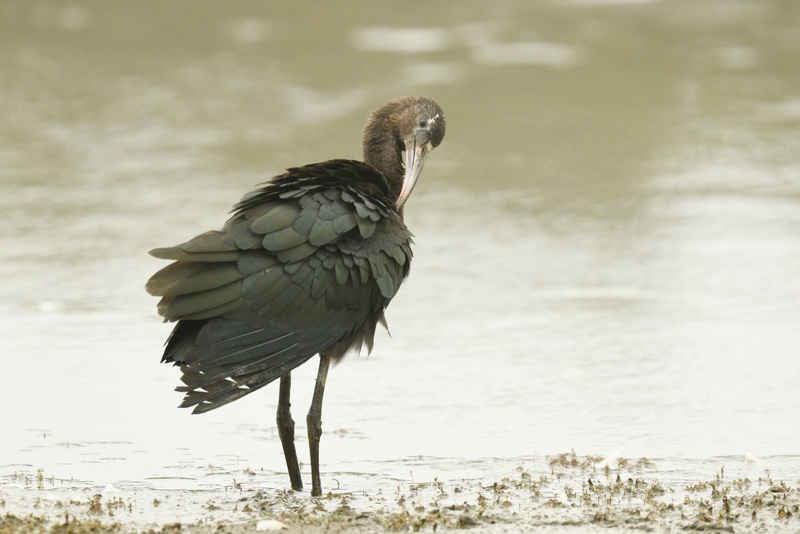 Despite its striking black and white plumage, this bird is of the Western form. Its the only Black-eared I have seen in Cornwall. The Isabelline Wheatear was found by Paul Freestone in October 2016 whilst birding on Godrevy Head. 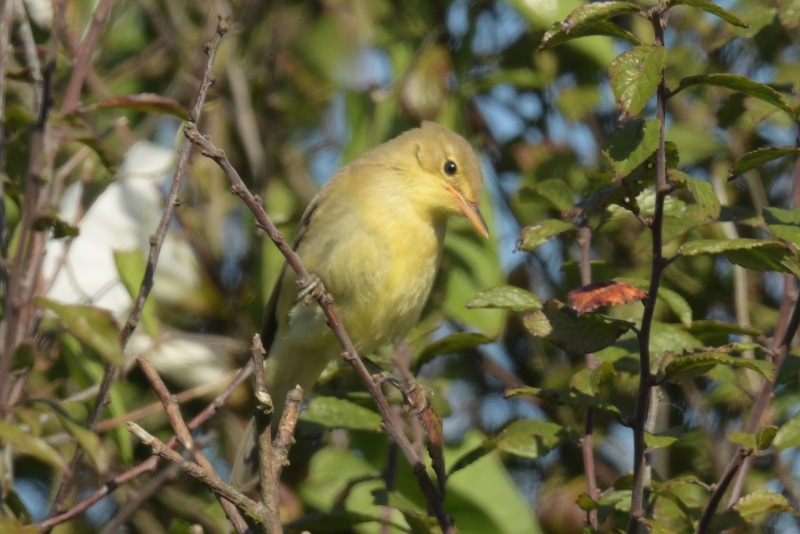 It stayed just one day and was admired by scores of local birders. It was the second record following a short stayer bird seen at Church Cove Lizard and by John Martin, a visitor birder. 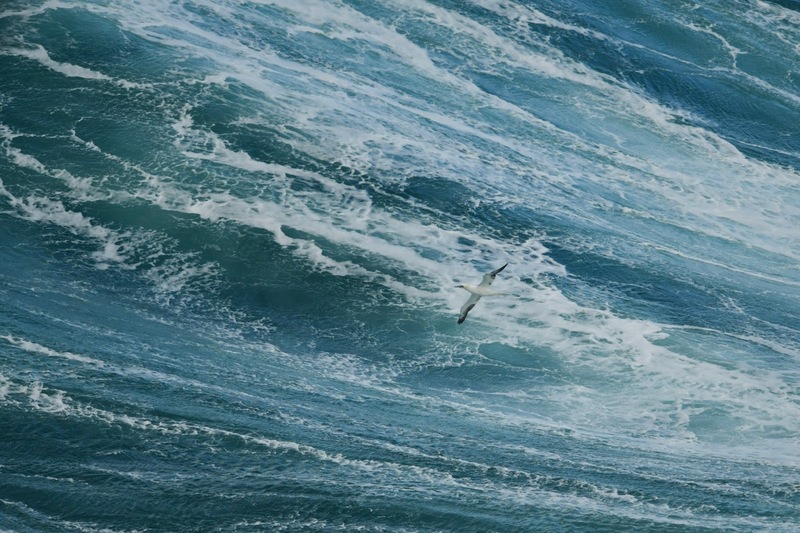 It was only a matter of time before a Pallid Swift would turn up in Cornwall this Autumn. With so many others dotted around the east and south coasts, one would surely end up in Cornwall. On Sunday 18th an early shout went out of a swift seen flying over Rose Valley near Pendeen. Several birders searched the various nearby valleys and likely spots but without luck. At around midday, another report was sent in to Cornwall Birding of a swift around the Land's End complex. Luckily John Chapple had just arrived on site and connected pretty soon. With close views overhead, he was sure it was a Pallid Swift and put the news out. I called John, got some details and arrived ten minutes later. I also connected quickly as the bird hawked low over the moor to the north of the complex. 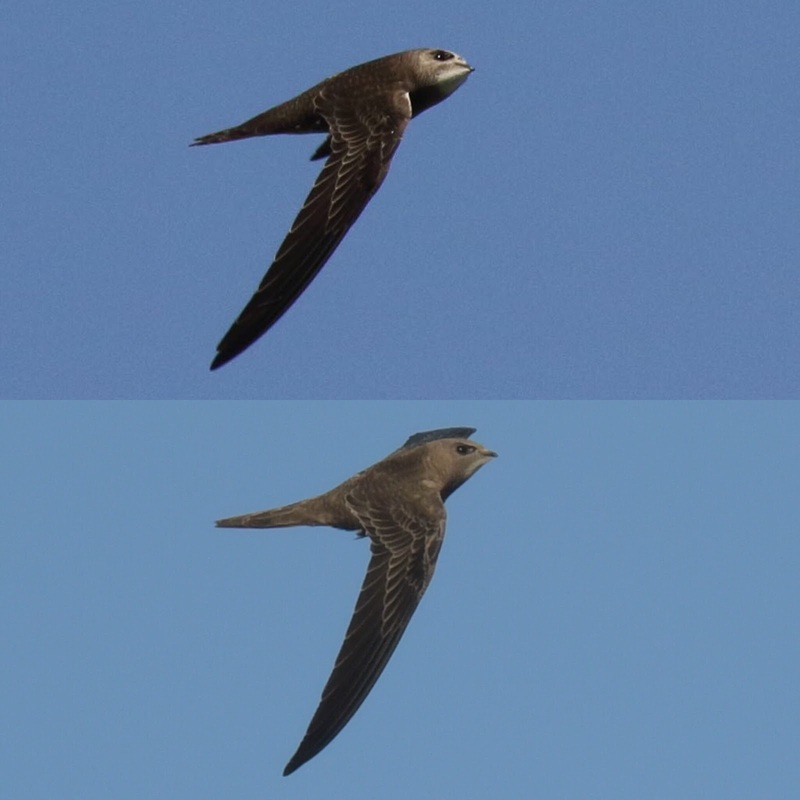 In perfect light with the sun behind us, we could see the paleness of the bird and why its called a Pallid Swift. The dark inner axillaries/secondaries compared to an otherwise pale underwing was immediately noticeable, even at distance through my bins. Within an hour, some 20 more birders had seen it. After a close look at the accepted records, this bird is the fourth record for the county and my first for Cornwall. The first record was at St Levan in November 2004. 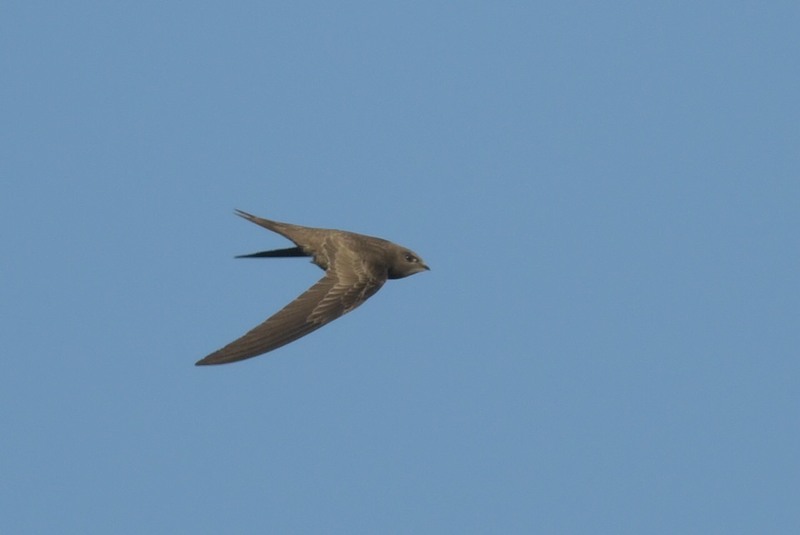 First noted as a swift sp, it was later accepted as a Pallid Swift in 2005 (CBWPS Report 2005). The second was at Wadebridge in June 2007. 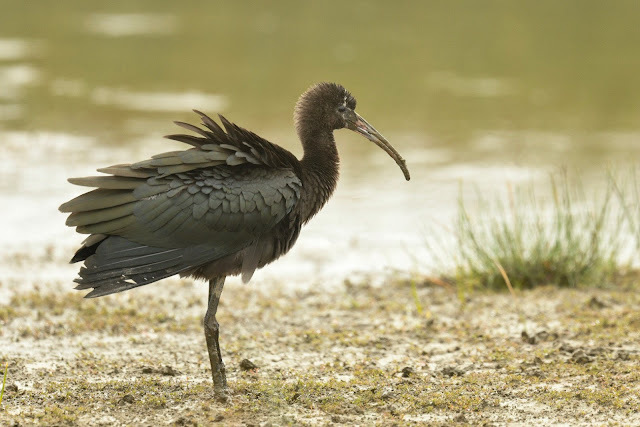 The third was found by Kester Wilson at Nanjizal in May 2009. 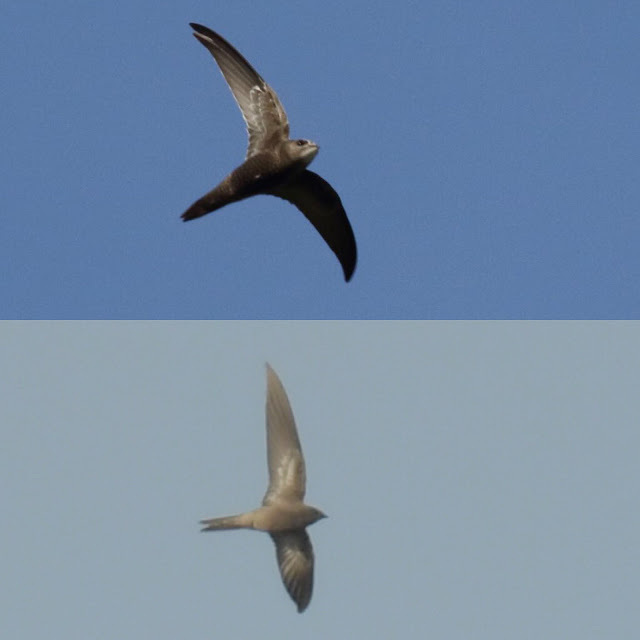 There was another interesting swift in Nov 2016 found at Kenidjack and then Botallack/Pendeen, but it was eventually considered to be a Common Swift, possibly of the subspecies pekinensis, though the latter has yet to be accepted in the UK. Pallid has less clear white trailing edge to the secondaries. 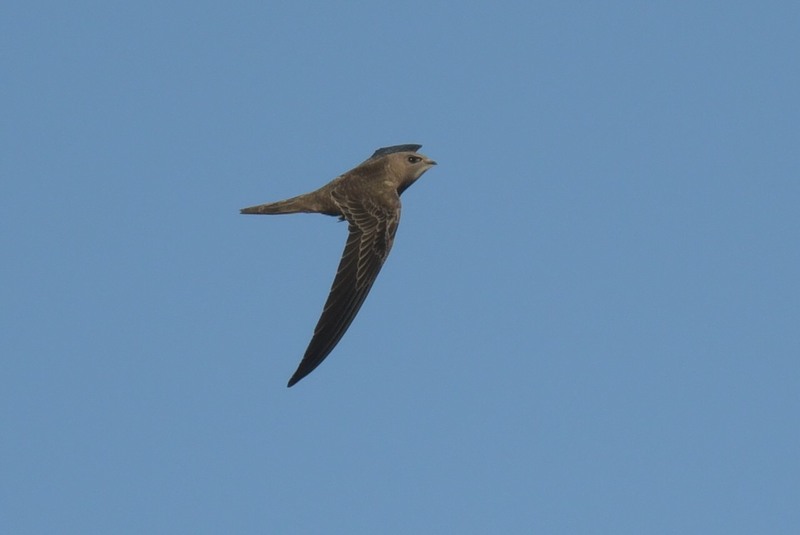 Pallid Swift, Land's End, Nov 2018, Steve Rogers. 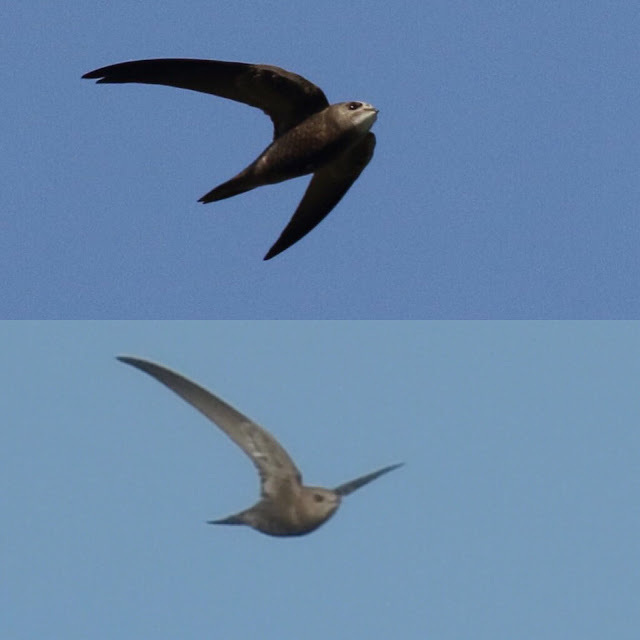 Upper image shows 2016 Kenidjack Common Swift by John Ryan, compared to the 2018 Pallid Swift at Land's End. (Text edited, video added, 5pm 15th Nov). 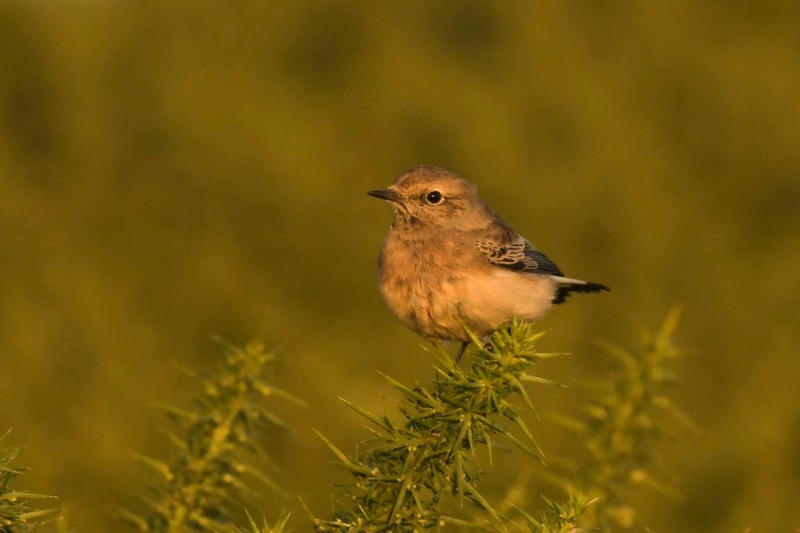 A Pied Wheatear was found on Trevose golf course on Thursday 8th November. It was sadly suppressed (by instruction from the golf club manager) for three days as it was on the course whilst machinery was in use. News eventually leaked out on the Sunday but it was too late to connect with it. Pete Roseveare got a tip off from Clive Thomas that it had been relocated on Dinas Head, about a half mile from its original location. Thanks to Clive's nod, Pete and Bob saw this super rarity on Wed 14th early morning and duly let the news out for all to share and enjoy. I managed to see it today (15th Nov) and got stunning close views with a dozen or so others. What a cracking bird it was and I am so pleased that the news came out. For me its a first for Cornwall as I missed the 1991 male at Dodman Head. And of course the Botallack male in October 2015 was identified retrospectively from photographs, so no one had any chance with that. So the Trevose bird is the third for Cornwall and the first female. In birding slang, its an unblocker for me. In context, two others turned up in the UK at the same time; a well watched male in the Wirral and another in the Northern Isles. The species breeds as close as eastern Europe (Romania/Bulgaria) but the range extends well east towards Iran, Iraq, Caspian Sea, Afghanistan and onwards towards China. It winters in India and north east Africa. First year female Pied Wheatear, Trevose, Nov 2018. Nikon D850, 500mm F4 plus 1.4x Converter. Tripod. A Curlew Sandpiper in winter plumage has been seen for the last few days on the shingle and rocks just in front of the Lidl superstore at Wherrytown. 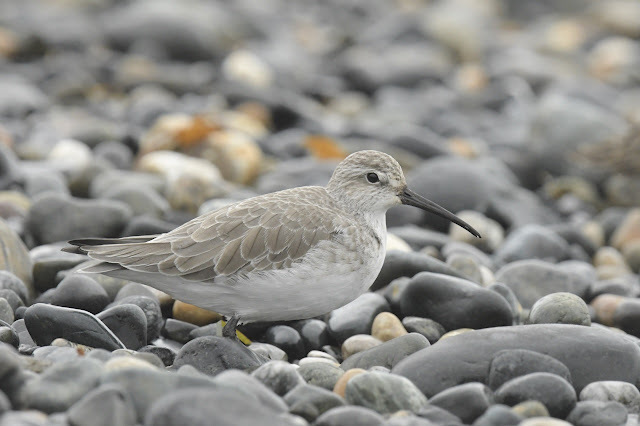 As with most small waders, it is confiding and allows reasonably close views. 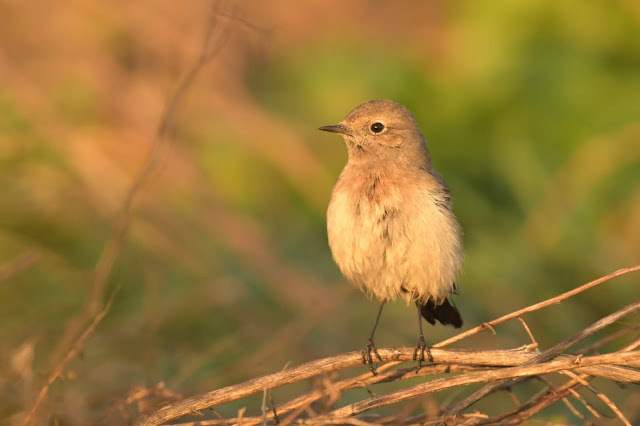 Its also unusual to see a winter plumage bird as most sightings are juvs in their impressive apricot coloured plumage. November records are decidedly rare. For instance none were recorded in 2015 and just three in 2016. The vast majority of the population will now be in south west Africa. Hundreds of thousands winter in Namibia. Curlew Sandpiper, Wherrytown, Cornwall Nov 2018. Nikon D850, Nikon 500mm F/4. 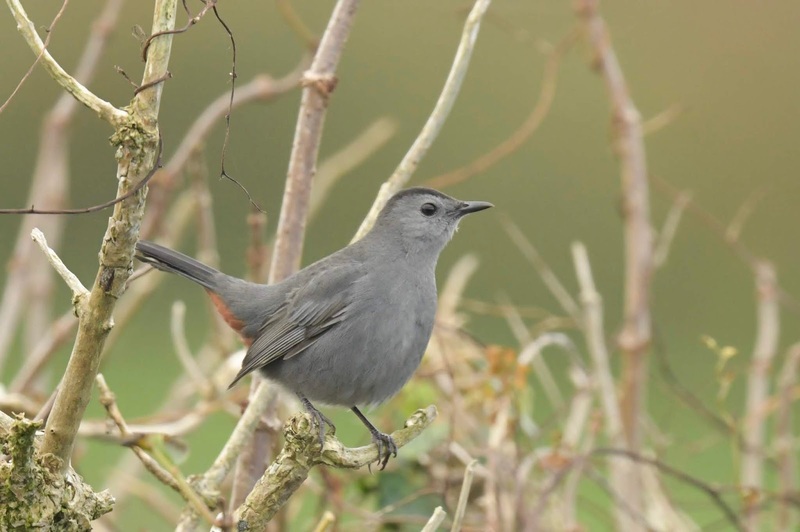 A Grey Catbird was found at Treeve Moor, Land's End on Monday 15th October by visiting birder Graham Mitchell. Graham was 100% sure he knew what he had found. News soon spread and the first images appeared early evening. By the following morning I estimate around 500 birders had already seen it. It took a long two hour wait that morning before it appeared in poor light. The release of tension was palpable as it eventually showed well in the willow clump 25 m in front of the assembled crowd. As most locals did, I went back for a second visit in better light and got some crippling views. This is the first record for Cornwall and just the second for Britain. The first was in 2001 on Anglesey though this bird proved incredibly illusive. This is a pointer and indicates that many birders would have dipped the Wales bird, and hence why so many have visited Cornwall. The Cornwall bird was obviously caught up in the Hurricane Michael which hit Cornwall on the Friday and Saturday (12th and 13th Oct). To put the arrival in perspective, a massive and unprecedented fall of vagrants landed at Flores and Corvo islands in the Azores at the same time. Highlights there included Wood Thrush, Wilson's Warbler, Black-throated GReen Warbler, Yellow-throated Vireo, Ovenbird, Bobolink, Baltimore Oriole, Rose-breasted Grosbeak and nine Red-eyed Vireos! One can only speculate what other unfound vagrants hit Cornwall! 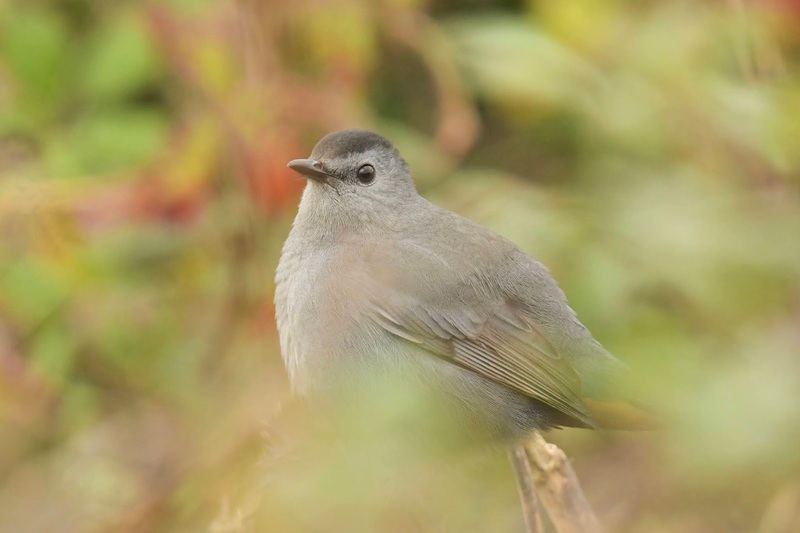 Grey Catbird is native to most of North America east of the Rocky Mountains. The species migrate to the southeastern United States, Mexico, Central America, and the Caribbean in winter; except for the occasional vagrant they always stay east of the American Cordillera. They are extremely rare vagrants to western Europe. 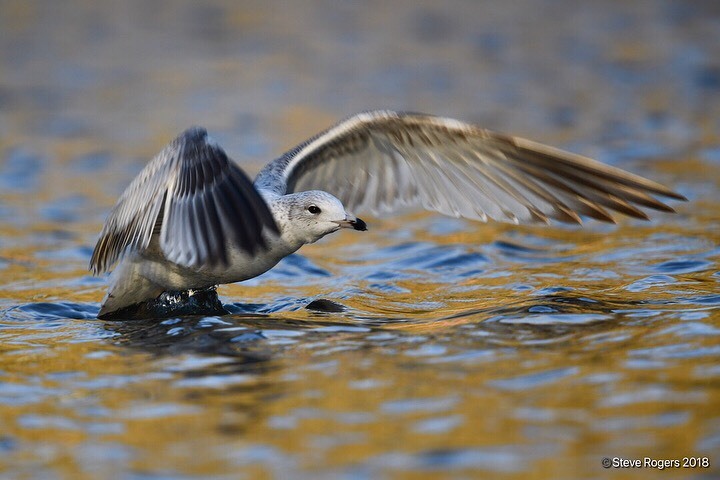 Normally present on the breeding grounds by May, most leave for winter quarters in September/October; as it seems, this species is increasingly extending its stay in the summer range, with some nowadays remaining until mid-winter as far north as Ohio. The gray catbird is a migratory species. Spring migration ranges from March to May, and in the fall ranges from late August to November. (from Wikipedia). On a personal note, everyone is obviously grateful to Graham for finding it (and releasing the news) but also thanks to Liz of Treeve Farm House for opening the field to allow the hundreds of cars to park safely. 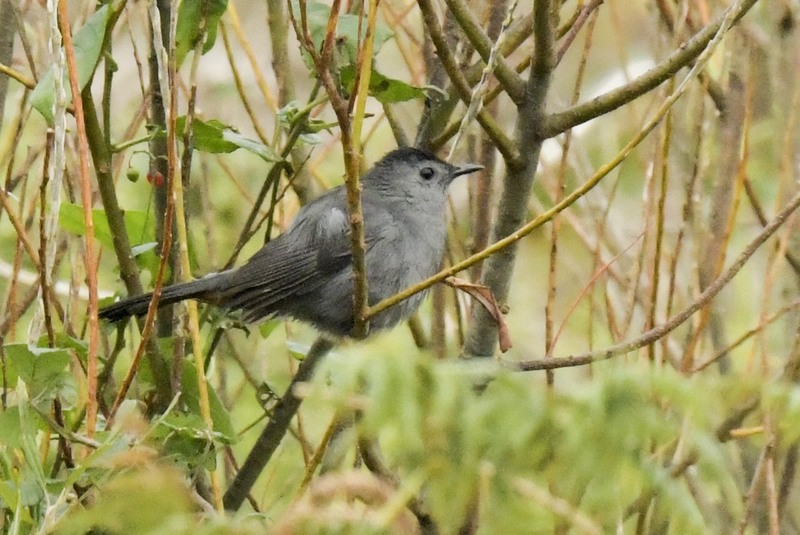 Grey Catbird on Sunday 21st October 2018, by Steve Rogers. (It was present for 15 days, last being seen on Monday 29th October). On Tuesday 18th September, a juvenile Lesser Yellowlegs (Tringa flavipes) was found by Steve Votier at the high tide roost at Tallacks Creek, Devoran. This record is approx. the 48th for Cornwall. A Spotted Redshank (Tringa erythropus) and a Wood Sandpiper (Tringa glareola) were also in the area. The Yellowlegs was last seen on Thursday 20th. This site is fast becoming a well known roosting site for waders at high tide. 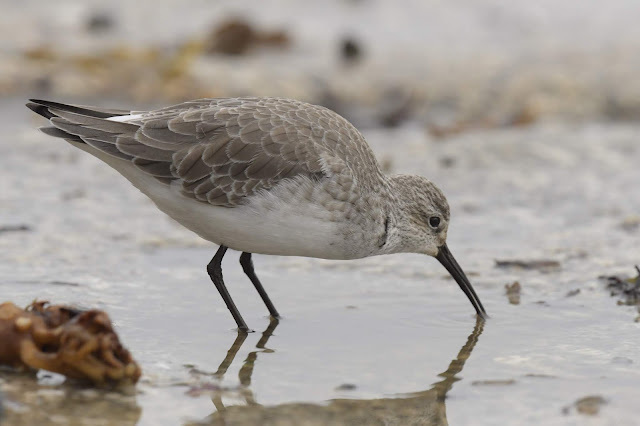 It is particularly favourable to tringa family of waders. Throughout July high numbers of over one hundred Redshanks used the site for a stop over. 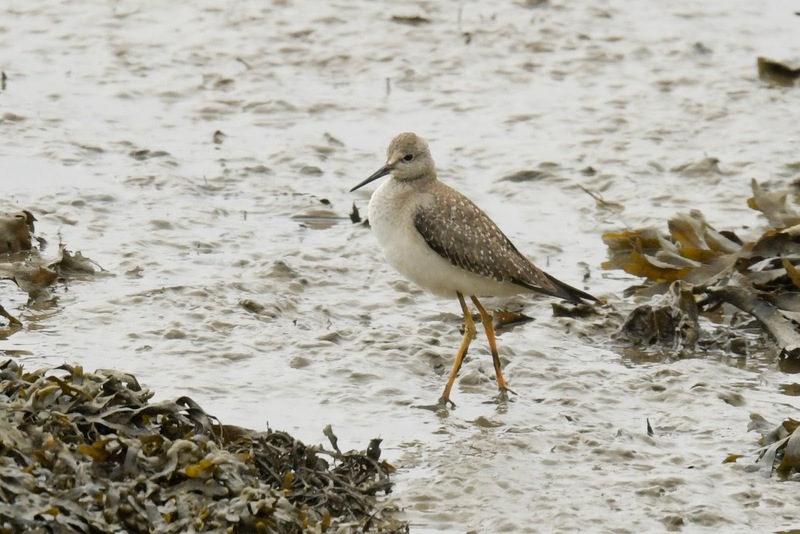 On Thursday 26th July, a long awaited Marsh Sandpiper (Tringa stagnatilis, first for Cornwall) appeared at exactly the same spot as the Yellowlegs. So, I'm not sure if the good people of Devoran will want their village renamed, but Tringaville seems quite apt. An obliging Melodious Warbler was found on Friday 7th Sept by Mark Pass in the area of the waterboard pumping station near Caerthillian. It was regularly calling a soft churring sound and was quite showy at times. Several other decent drift migrants were in the immediate area including Red-backed Shrike and Nightingale. Just under 170 sightings have been recorded in Cornwall, the majority in September. Porthgwarra is the top site with 58 records alone. The image below was taken on Sunday 9th by myself. The video is by John Chapple. 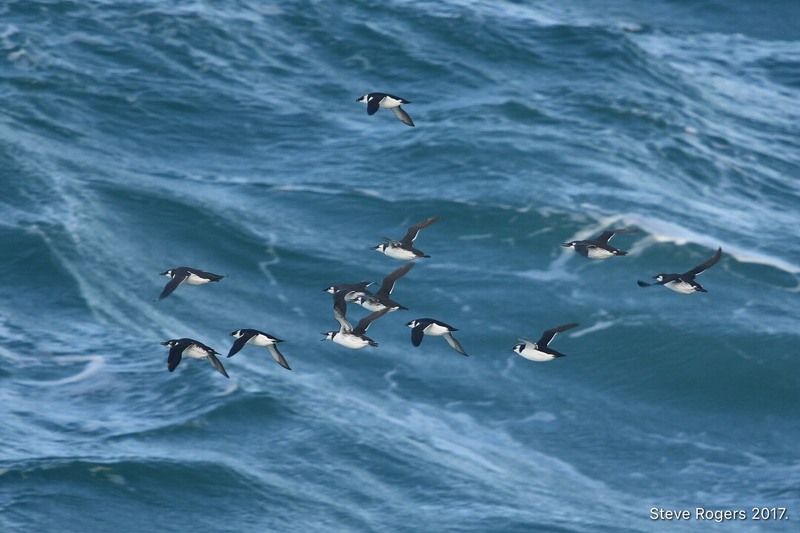 Below are some images of mixed auks moving west off Pendeen late last year. They mostly include Guillemot, but there are also a few Razorbills. Pendeen is an incredible place to bird from but in the big gales, the kit needs to be completely sealed from the excessive spray. I wouldn't encourage getting too close to the rocks either. Last night (16th Jan), the storm reached 41 kph with 8.2 m wave height! Northern Gannet climbs a massive sea wall at Pendeen. 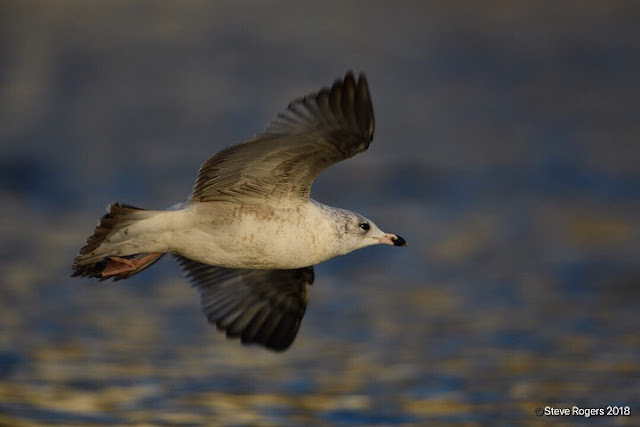 Following Storm Eleanor last week, several scarce gulls have been recorded in the region. The prize Arctic finds such as Ross's Gull and even Ivory Gull failed to materialise in the west country but several Glaucous and Iceland Gulls appeared at the normal coastal sites. 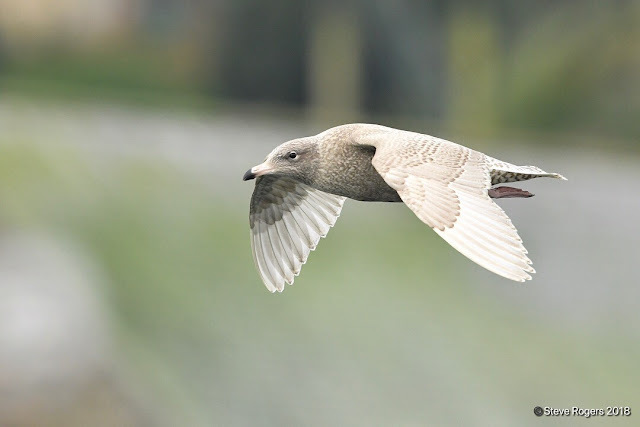 One very confiding Iceland Gull has spent a few days at the flood meadow at Marazion Marsh. 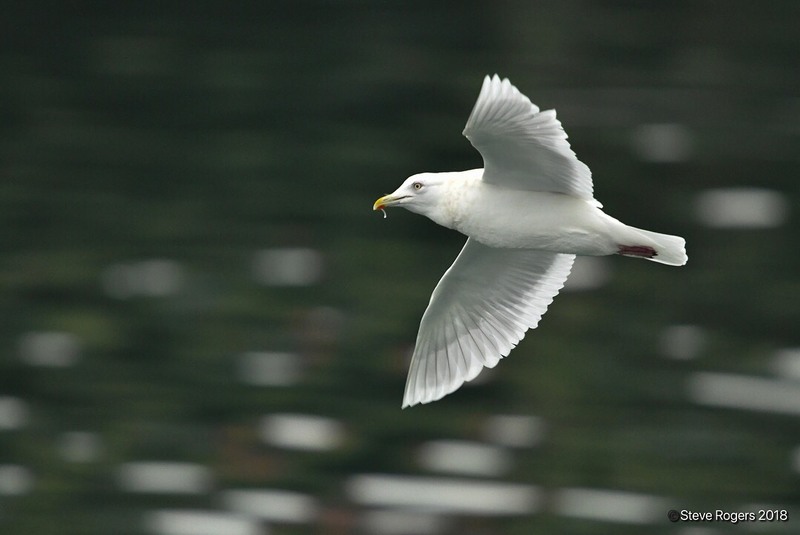 These large "white-wingers" fluctuate annually in numbers based on the Arctic temperature and Atlantic gales. Ad Iceland Gull, Newlyn Harbour, Jan 2018. 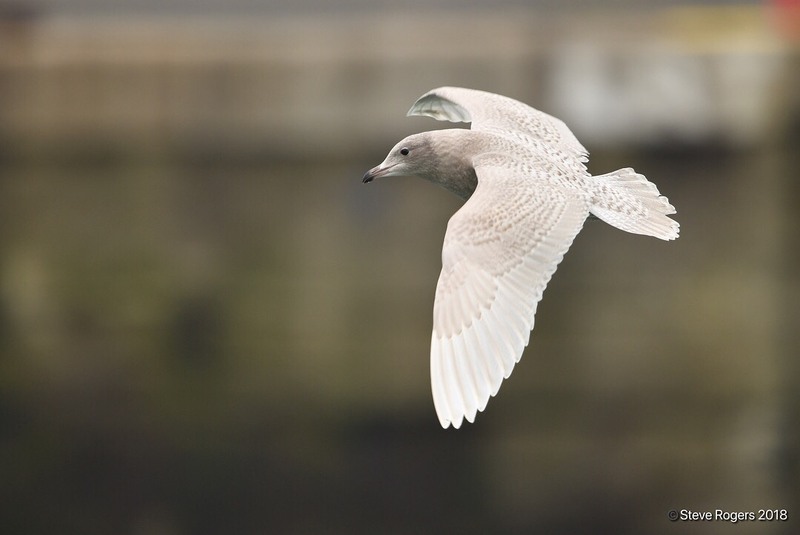 2nd Cal Yr Iceland Gull, Newlyn Harbour, Cornwall, Jan 2018. 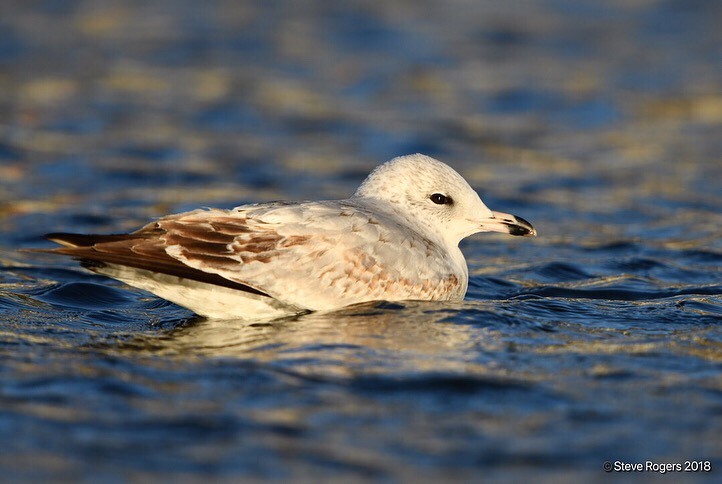 A bonus juvenile Ring-billed Gull was a surprise find on Trenance boating Lake, Newquay last week. 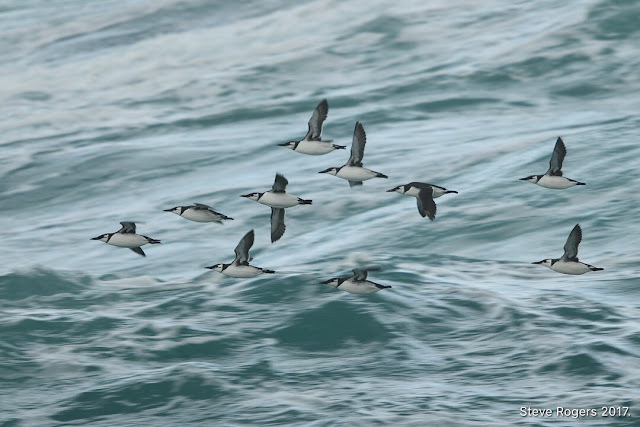 Cornwall averages one or two sightings annually. They most likely originate from Canada or northern USA. A rarer record would have been a juvenile Bonaparte's Gull in Mount's Bay but sadly the views were not good enough to clinch the identification. The regular wintering adult Bonaparte's Gull has returned to Exmouth, Devon. (6th Jan). 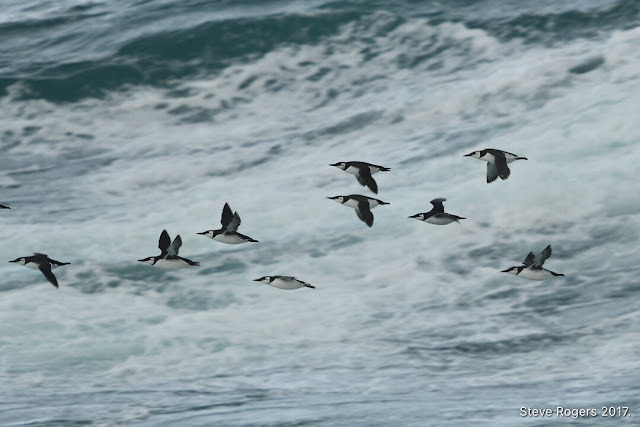 Keeping with the American theme, the two over-wintering Surf Scoters at Porthpean bay (St Austell) were joined by a third male bird following Storm Eleanor. 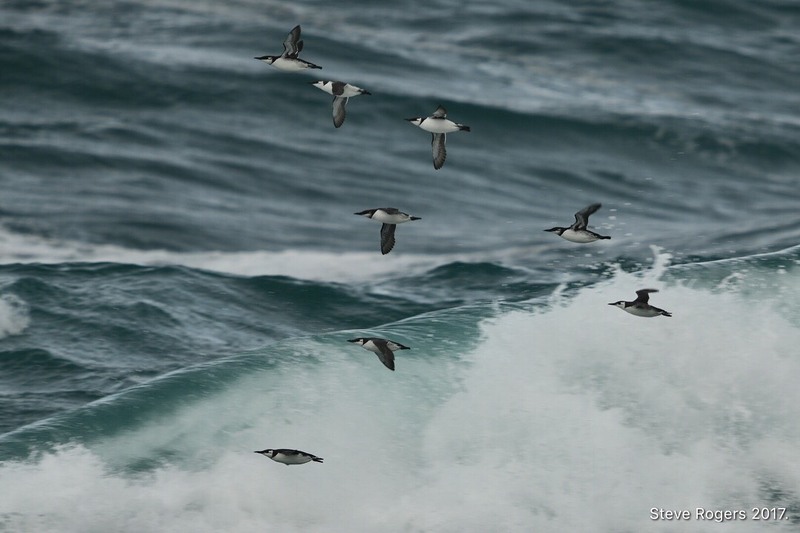 The supporting cast of a scarce Velvet Scoter and Long-tailed Duck make a necessary visit to the site. Hawfinch's continue to show well across the region. The unlikely favoured places are graveyards. Hawfinch feeds on berries and the graveyard yew trees seem attractive. Five birds have been spotted at Egloshayle cemetery, two at Feock church, Devoran, Saltash and various sites in West Penwith. Hawfinch irruptions are rare on this scale. Now is your chance to see one. Devon birders will be delighted to hear this week that the Elegant Tern seen at Dawlish Warren in May 2002 has now been added to the UK official list, taking the total to 615 species. Elegant Tern is a Pacific species, breeding in south west USA and Mexico. Recent research has shown beyond doubt that Elegant Terns are occurring this side of the States and even breeding in the Western Palearctic. On the flip side, Cornish birders will be disappointed to see that the Royal Tern, also an American species, has been removed from the archive. The record, which dates back to September 1971, has been reviewed by the Rarities Committee and is now considered unproven. The Snowy Owl which appeared in Cornwall last month has been relocated on St Martins, Scilly. The world status of Snowy Owl has recently been reclassified as "Vulnerable," so cherish the memories as this species will become more difficult to find. On the other hand, Cattle Egret numbers are increasing with a maximum count of 15 near Manaccan, Lizard. This species looks set to follow its congener, the Little Egret in becoming a regular fixture in the south west.